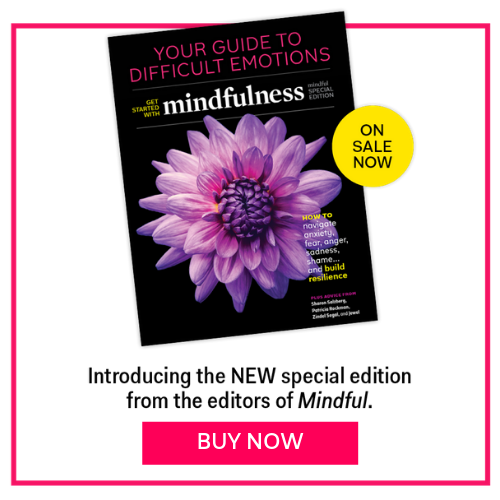 This 10-minute practice helps you identify your feelings, so you can gain emotional freedom. “Name it and you tame it.” Naming or labeling difficult emotions helps us disentangle, or “unstick,” from them. Research shows that when we label difficult emotions, the amygdala—a brain structure that registers danger—becomes less active and is less likely to trigger a stress reaction in the body. When we gently say, “This is anger” or “Fear is arising,” we usually feel some emotional freedom—there is some space around the feeling. Instead of being lost in the emotion, we can recognize that we are having the emotion and therefore have more choice of how to respond. Find your seat. Start by finding a comfortable quiet place to sit in a dignified posture, which is relaxed but upright, tranquil, and alert. Close your eyes fully or partially. Take a few deep breaths to allow your body to relax. Shift attention to sensations in the body. Bring your awareness to your body by noticing your posture. Feel the world of sensation occurring within your body at this very moment. Notice your breathing. Now place your hand on your heart and begin to feel your breathing: the out-breath and the in-breath. If it’s easier, just focus on one, and rest, waiting for the next breath. Do this for another minute, and if along the way you’d like to let your hand slowly fall to your lap, feel free to do so. When you get distracted, come back to the breath. When you notice your mind has wandered, as it always does, gently come back to your breath as a touchpoint again. As you continue mindfulness of breathing, notice what emotions begin to surface. Shift your attention from your breath and ask yourself: What am I feeling? What emotions are my feeling, right here right now? If you sat down for this exercise without any strong emotions, perhaps you’re feeling contentment. Or perhaps you’re curious, or maybe there’s another emotion inside such as longing or yearning, or perhaps sadness or joy, worry, perhaps a sense of urgency. Maybe loneliness. Or maybe you’re bursting with pride or feeling lost or envy. Maybe you’re having a lot of feelings. Label the most prominent emotion or emotions. Try to identify the strongest feeling that you’re having and give it a name quietly in the midst of your feelings and kind of using your body as an antenna, perhaps only picking up faint signals. Faint signals that first let yourself be aware what emotions are percolating in your body. And when you have an emotion and you have a name for it, have a label for it, then repeat that name three times in a kind, and gentle voice. For example, worry, worry, worry, joy, joy, joy. Return to your breath, feel your breath. And now go back and forth between your breath and your emotions in a relaxed way. Continue to shift between the breath and the emotion you are holding. So when you feel the emotion, label it and then return to your breath. If you feel overwhelmed by the emotion or it’s very disturbing, then just stay with your breath until you feel better. Show yourself loving-kindness. Breathe, feel each breath, and keep your hand over your heart, feeling the warmth of your hand, and the loving-kindness, the good will that’s within you and has even inspired you to undertake this exercise. The wish to be happy and free from suffering. Feeling that innate good will and breathe through your heart. And when the emotion arises or sweeps away your attention just label it and then return to your breath. Open your eyes. Slowly open your eyes if they have been closed. ﻿As you go about your day, know that you can always find refuge in your breathing and most emotions can be made more workable by labeling them. Excerpt adapted from The Mindful Self-Compassion Workbook by Kristin Neff and Chris Germer. Audio: © Christopher Germer & Kristin Neff. Mindful Self-Compassion. June 2017. All rights reserved. Christopher Germer, PhD, has a private practice in mindfulness and compassion-based psychotherapy and is a psychiatry lecturer at the Harvard Medical School/Cambridge Health Alliance. He is a founding faculty member of the Institute for Meditation and Psychotherapy and of the Center for Mindfulness and Compassion, author of The Mindful Path to Self-Compassion and co-creator of the hit online course "The Power of SelfCompassion."